Since we launched U2start.com almost 10 years ago now, we have always dedicated our efforts to share every U2 concert that has ever been recorded with the widest U2 fanbase possible. We have achieved this with the generosity of the tapers, who have taped the shows throughout the 40 years of U2's career, the people who have transferred and remastered them, and the websites that have hosted them. Nevertheless, U2start has never been about leeching – we are all about sharing. So why wait until a recording surfaces, when we can record and upload it ourselves? And hey, that includes YOU as well Through this series of articles, we will try to show the basic aspects of concert taping so anyone can jump on the train and start taping with little or no previous knowledge. We have several experienced tapers among us, so if you have any questions you can ask them in our dedicated Taper's Guide forum thread, whether they're related to our article or regarding a different taping matter. First of all, you need to decide what you're aiming for. What are you willing to sacrifice and how much money can you afford to spend? In this day and age every penny counts and we know it, so we will try to cover all budgets. Taping is a hobby (and a beautiful one), but it can become more of an obsession – just like memorabilia collecting, photography or musical instruments. So take it easy and try to decide what your target is. At U2start, we've got recordings that range from very poor audience recordings that are barely listenable, to excellent soundboard or master matrices that sound close to a recording that U2 themselves could sell at music stores. There are many different recordings and ways to get them, but we're going to limit our articles to audience recordings and methods of recording them. That doesn't mean you can't use this information to try and get other recordings like soundboard or IEMs, but we won't cover that area. Now we are aiming at audience recordings, there are many kinds and qualities. We have got 5 stars excellent recordings (take the MLK recording of 2010-10-08 – Rome as an example), pretty good recordings like 1992-05-18 – Barcelona and really poor recordings like 1983-11-27 – Tokyo. If you decide to tape a show, your results can be as good as the first example with the right gear and method, or almost as bad as that 1983 recording. It all depends, as we said above, on what are you willing to sacrifice. If you haven't done this before, your first taping will probably be not that good – don't worry, we've all pulled less than decent tapes every now and then, especially when we're just starting out Just keep going, take advice and criticism, ask questions and tweak your method next time: great recordings will eventually come And keep one thing in mind: buying truly superb (and expensive) gear will NOT guarantee you a great recording; and taping with less than excellent gear CAN result in surprisingly good recordings. There is much to this passion than money; your location, gear choice, acoustics at the venue, audience surrounding you, temperature, humidity, wind and many other factors can ruin an otherwise great recording, or make a tape sound better than what you actually heard while being there! First of all, you need a recorder. And that's not as simple as it sounds. There are literally thousands of digital and analog recorders out there than you can use to start recording live music concerts. We will give some advice for different budgets, but of course you can ignore them and just hunt for a suitable recording that you like better Before going with the suggestions, we will clarify something: there's no dictaphone/voice recorder that can do this job for you. You need a proper solid state recorder that can record in lossless format and with decent line-in/microphone inputs (we will explain this later on). Don't believe what you hear, don't believe what you see... Some might say that little money can't buy you good things, but experience proves them wrong. I have pulled excellent recordings with a recorder that can be seen sold new at under $40. Yep, $40 (or 30€), it's not a typo. Recorders like that are not easy to find, but they exist and are a very good option to start with if your wallet is not overflowing with banknotes. There are several similar ones like the DR-03, DR-08 and their Japanese counterparts, Teac VR-10 and VR-20, they all have the same or very similar features. There's also the Yamaha C24 (a little more expensive and less intuitive to use), and the infamous Zoom H1, which is a little flimsy and not really suitable for recording rock shows, although it can be an option if you don't find any of the suggestions above. Going a little further, there's very good options if you want to spend between $75 and $200. 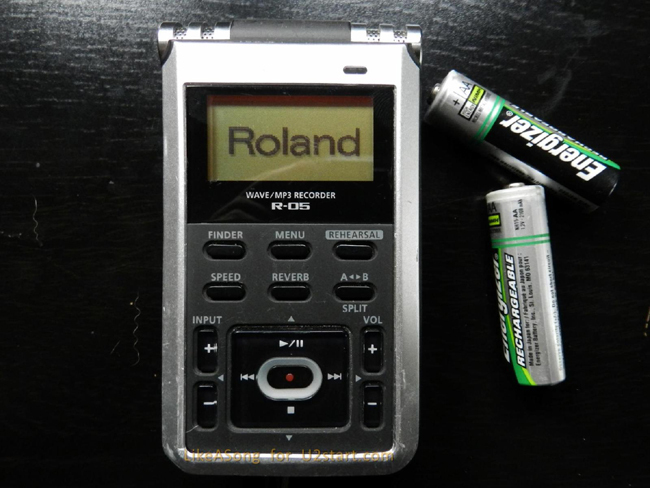 Watch out as names can get a little tricky: Roland R-05, Zoom H2 (and H2N), Tascam DR-05, and Olympus LS-11 are popular choices and usually go around the $100 figure when bought used in good condition on eBay or Amazon, or new on special sales. They all have similar features and build quality, with the Roland being marginally superior in our opinion. Just a matter of taste! Other similar but a little more expensive choices include the Sony PCM-M10 (one of the most reliable, convenient and overally excelent recorders in this price range according to most tapers), Tascam DR-07mkII and Tascam DR-40. Their features vary greatly and all of them have their pros an cons, which we'll be happy to discuss with you if you're interested in any of them in particular A personal favorite, although a little hard to come by for a good price, is the Tascam DR-2D. It's vastly versatile as it accepts 2 different inputs at the same time, something that usually only much more expensive recorders do, and will be super useful if you want to record with 2 different pairs of microphones, or want to do an audience microphone + IEM matrix on your own. Ok, so you got enough spare money after purchasing tickets for ALL THOSE Innocence&Experience Tour shows?? Wow, impressive Then there might be a great recorder waiting for you that most of us can't afford! If you're just getting into taping, you probably should ignore this, but who knows, maybe you start taping with a Sony PCM-D100 ($1000/875€) and pull out the best recording of a U2 concert ever! Tascam DR-100mkII, Olympus LS-100, and Zoom H4N usually go around $350/300€ new and are good options if you are not afraid to sneak bigger recorders into the venues; Tascam R-26 is probably the best in its ~400 bucks range. The bigger brothers in this family are recorders like the Tascam H2-PD, Nagra SD, Edirol R-44 or Tascam DR-680; they sell around or above $700/600€, and have features like washing the dishes or cooking some excellent Chinese food... Alright, they don't, but you get the point Multi-track recording, super wide frequency response, different XLR inputs, extra low TDH at 1kHz, excellent signal-to-noise ratios... Many of those features may sound like Korean to you, but they actually make those recorders worth every pennie! 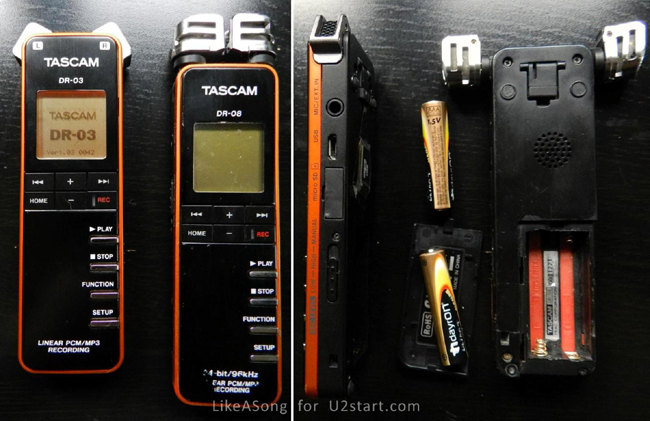 The article Taper's guide part 1: Your Target & The Recorder was first published 4 years ago on U2start.com by LikeASong.